The information our eyes receive is sent to our brain along the optic nerve. This information is then processed by our brain and helps us make appropriate decisions, for example if you can see an object flying in your direction then you will probably move quickly out of the way. Around 95% of animals have eyes. Some are very simple, just picking up light and dark conditions while others are more complex, allowing for the recognition of shapes, color and depth. Like humans, some animals have eyes placed close together that allow for improved depth perception, others have eyes spread further apart (often on opposite sides of their head, as in horses) to allow for a greater field of view and an early warning against potential predators. The light sensitive tissue lining the inner surface of your eye is known as the retina, acting in a similar way to film in a traditional camera. Cone cells in the retina detect color while rod cells detect low light contrasts. The part of the eye that allows us to focus on different things in known as the lens, it changes shapes so we can focus on objects at various distances. The cornea is the transparent covering of the iris and pupil, along with the lens it refracts light so it can be projected onto the retina. The central opening of your eye is known as the pupil, it changes size depending on the amount of light. The colored area around the pupil is called the iris, it controls the size of the pupil and can be colored brown, blue, green or other colors and shades depending on the person. Scientists believe that animal eyes evolved around 500 million years ago, beginning in simple form (perhaps just distinguishing light and dark) but giving a distinct advantage. This advantage led to eyes evolving quickly amongst animals (by evolutionary standards) as those without the ability to see struggled to survive against those that could. Throughout the animal kingdom there are many different types of eyes, for example the human eye is very different to the compound eye of a fly which is better at detecting fast movements. 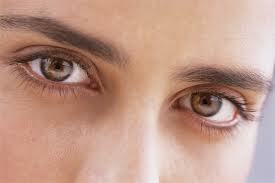 Human eyes contain a small blind spot where the optic nerve passes through the retina. Our brains use information from the other eye to fill in the vision gap so it is rarely, if ever, noticed. Glasses and other protective equipment are often worn by humans to protect the eyes from UV rays or during various dangerous activities such as welding. Glasses and contact lenses are worn to correct common sight conditions such as short and long sightedness. Eyes are composed of more than 2 million working parts. Eyes can process 36,000 bits of information every hour. Eyelashes have an average life span of 5 months. Your eye will focus on about 50 things per second. About half of our brain is involved in the seeing process. Humans are very much visual animals. 10) The external muscles that move the eyes are the strongest muscles in the human body for the job that they have to do. They are 100 times more powerful than they need to be.